Bruker’s microplate extension HTS-XT allows the application of FTIR spectroscopy as technique for high-throughput screening. The acquisition, control and assessment of spectral data from numerous samples are performed by the OPUS/LAB software. 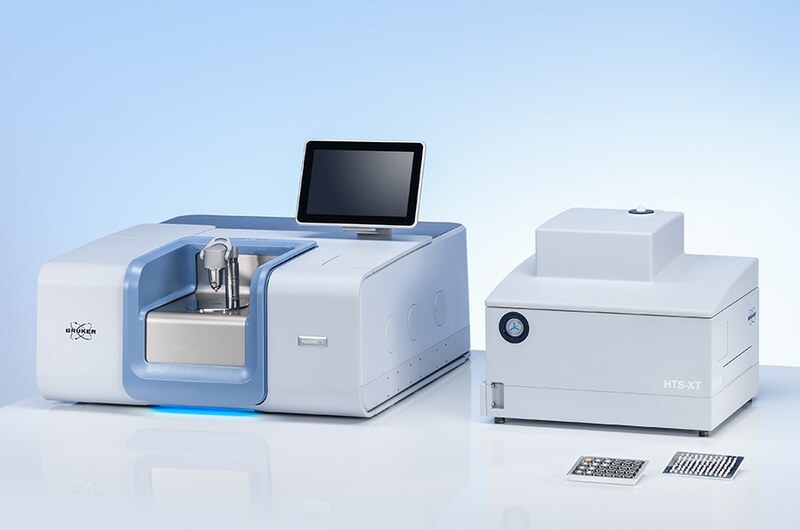 The HTS-XT is an external module that can be linked to various Bruker Optics FTIR spectrometers. Depending on its configuration, it can be used for measurements ranging from the mid infrared to the near infrared and even the VIS range. The sampling plates for the IR analysis correspond to the standardized 96- or 384-well microplate formats. For analysis, approximately 1 - 20 µl of a liquid sample is placed on a single sampling position of the microplate and dried. The prepared sample volume depends on measurement mode, sample form, and sample plate design. First, solid samples are dried and ground then they are filled into a well of the microplate. The loaded sample plate is moved into the sealed optics by a motorized drawer. Next, the measurement of the microplate is conducted fully automated in the measurement modes transmission and/or reflectance by consecutively moving each sample position into the focus of the IR beam. The HTS-XT Microplate Extension is controlled by the OPUS/LAB software, which allows the automatic measurement and assessment of spectra from large sample numbers. For the quantitative determination of even several analytes in complex samples, advanced multivariate techniques such as Partial Least Squares (PLS) are used. To conduct qualitative analysis several algorithms such as spectra correlation, Principal Component Analysis (PCA), and Artificial Neural Networks (ANN) are available. The storage of measurement parameters and results in a log file allows an easy transfer of sample data to Laboratory Information Management Systems (LIMS) or to external programs. The general advantage of the IR spectroscopy is the availability of the molecular information present in each IR spectrum. While other high-throughput techniques require the use of specific marker systems to allow the analysis of a specific parameter, the infrared microplate analysis offers a whole range of molecular and structural information on the substances of interest. Therefore, FT-IR spectroscopy allows the parallel determination of a number of parameters with just a single measurement.